I have a confession: While I remain loyal to stamping, I am very fickle when it comes to art techniques and mediums used in or along side of stamping. If you immerse yourself in a topic, as I do when I research an article, you are likely to either get really, really sick of it or you get really, really enthused about it. Nine times out of ten, when I focus on a stamping related topic, I get enthused. In fact, that new-to-me art medium or set of techniques often becomes my favorite art medium or favorite technique EVER . . . until the next in-depth article and my new obsession. That is where my fickleness comes into play. Before I discovered stamping, I tried lots of different art techniques and crafts, from sketching and linoleum block printing to basket making, sewing, needlepoint, cross stitch, tatting, knitting, crochet and many other crafts you will find in the aisles of local craft or needlework stores. I’ve probably tried most of them at some point or the other. But for over twenty years, stamping has been the creative activity that has stuck. I think a lot of that has to do with the way stamping can pull in so many art mediums and bits and pieces of so many other art and craft techniques. You can use your stamps on a basket you’ve made or on the walls in your house or to decorate a handmade book. You can use your sewing or needlework skills to add stitched embellishments to a stamped card. You can add little sketched details to a stamped scene. You can use stamps to decorate a scrapbook or a journal. You can stamp on shrink plastic or clear acrylic frames or ornaments or use stamps to create jewelry. You can stamp on wood boxes or frames or stamp and embellish metal or fabric or leather. Stamped images can be colored in with colored pencils or Gel Sticks, watercolor markers or acrylic markers or even crayons or watercolor paints. 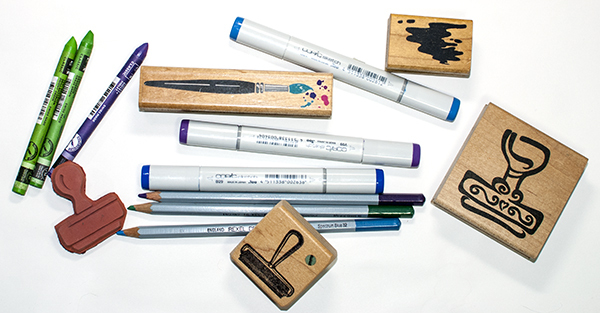 You can stamp with all kinds of inkpads or stamp with watercolor crayons or markers or even acrylic paint. There is just so much that you can do with a stamp that it just doesn’t get old. Stamping allows you to be fickle because it has such a wide sphere of possibility. This week I am exploring stamps with Gelli Plates, looking to see if this way of creating monotypes and monoprints will get me as excited as using stamps with watercolor crayons or powdered pigments or card folds or all the other things that excite me that I’ve written about recently. What are YOU working on this week? What art mediums or techniques are you currently enthused about? Thanks, Nancie – I love to see people get excited about the craft they are working on. My daughter and I attend a mixed media group that meets weekly at the Senior Center. We introduced painting or drawing on gourds to them yesterday, because Carol (my daughter), had a lot of gourds from last year. They took a bunch home and seemed to be excited to work on them —- and I am excited to see what they will do with them. I did Zentangle on the sample I made for them, but plan to do a lot more. 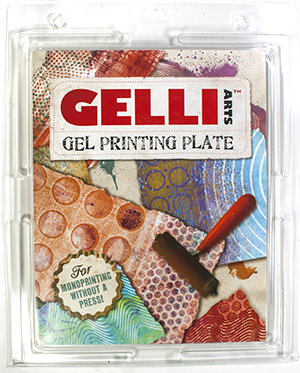 I recently bought a Gelli plate. I’ve used stencils and other tools for making marks in the acrylic paints. Hadn’t thought of stamps though so I’m looking forward to what you learn! I certainly can relate Nancie…my present interest is also the Gelli Plate…it is so versatile. After you finish playing with the normal acrylic paints, give Distress Paints a try…you do have to work fast, but your paper has a fabu finish – smooth! Regular acrylic paints have fillers and therefore your paper will feel gritty – not so with the Distress Paints! People won’t believe that you monoprinted your pull because of the great finish!!! Have FUN! P.S. Because of your article about washing acrylic off items in your sink, I clean with alcohol (70% for stencils and impression stuff – 90% for my rubber brayers and then wash with soap and water before putting them away). Thanks again for that article!!!! Hi Jan, Thanks! I’ll definitely give the Distress Paints a try. If you have any artwork created with the Gelli Plate, please consider submitting it for possible inclusion in the upcoming eArticle. I’m looking a bit short on submitted art this month. I can of course include my own artwork samples, but I think it is much for interesting to see how different people use the same tools. I’m glad that the post on washing acrylic paint off tools was useful. Be really careful with alcohol on rubber as it can dry it out really fast. If you use it to clean, definitely DO wash off the alcohol with soap and water so it doesn’t sit on the rubber and dry it out. If you can avoid using alcohol, that would be better of course, but I know that getting stubborn paint off can be a challenge.